Three things you need to know going in about Detective Pikachu: 1) It’s not hard. 2) It’s not long. 3) Detective Pikachu himself makes the whole thing worth playing. Detective Pikachu is the story of Tim Goodman, a young man who heads to Rhyme City in search of his missing father. 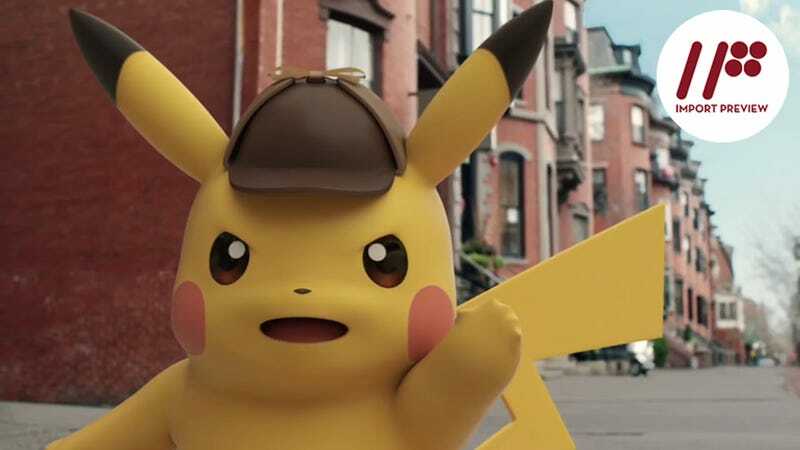 Shortly after his arrival, he comes across Detective Pikachu—that is to say a pikachu in a deerstalker cap—and the two are thrust into an adventure to catch a thief and return a young girl’s stolen necklace. What makes their relationship different from the average trainer and pokémon is that, to the surprise of both, Tim is able to understand Detective Pikachu as if they were speaking the same language. To the rest of the world, however, Detective Pikachu sounds like any other pikachu. But while Tim can understand Detective Pikachu, he can’t understand any other pokémon—not even other pikachu. Why exactly this is and what connection the two share is one of the game’s looming mysteries. Although Tim can’t understand other pokémon, Detective Pikachu has no problem playing translator. So while Tim can interview the human witnesses and suspects, Detective Pikachu can do the same for the pokémon witnesses and suspects. The pair’s ability to communicate gives them an edge in solving crimes and explains why a teen is able to solve cases that the police cannot. The game itself is basically three lengthy multi-part puzzles. The first uses the stolen necklace scenario to introduce the pair and the game flow, while the second and third follow them as they work to track down Tim’s father. To solve each puzzle, you interview all the people and pokémon in a given area and then search for clues. Once you have all the info you need, you then do a simple logic puzzle to highlight the important facts of the case so far, or to overcome some sort of physical obstacle. Overall, the game’s puzzles are far from difficult, even less so if you have a working knowledge of some of the most famous pokémon and their powers. This is clearly a game meant for Pokémon fans of all ages, and even children under 10 will likely have little trouble solving the game’s puzzles. The only other gameplay Detective Pikachu has to offer comes in the form of the occasional quicktime event. Failing these doesn’t actually alter the plot of the overall game, but instead simply gives an alternate—and often far more entertaining—version of the scene that follows the quicktime event. As the first chunk of an episodic title, Detective Pikachu does little beyond introducing the characters and building up the mystery surrounding Tim’s father. Over the game’s six hours, little is revealed and you are left with far more questions than answers. With little beyond simple puzzles, quicktime events, and Pokémon fanservice, it would be relatively easy to write off Detective Pikachu—that is, if it weren’t for the existence of Detective Pikachu himself. Detective Pikachu is easily the most entertaining part of the game. With his deep voice and often grimacing face, he seems more like an old man trapped in a pikachu’s body than any of the numerous pikachu we have encountered before. He drinks coffee, has an intellect capable of solving mysteries, and even hits on every pretty woman he sees. Much of the game’s best humor comes from how human Detective Pikachu is and, in contrast, how horribly inept he is at being a pikachu. In a world where pretty much every pokémon is trained to fight in some form or fashion, it’s almost a shock (forgive the pun) to see a pikachu that can’t do a thunderbolt on command. Of course, he’s not afraid to play the role of “normal cute pikachu” if it gets him what he wants, especially in the women and food departments. Detective Pikachu is, on its most basic level, a point-and-click adventure game no different from the ones I grew up with in the 90s, other than the inclusion of Pokémon, anyway. Children will likely get much more out of this game than adults; nonetheless, if a short, simple point-and-click adventure about a Pikachu solving pokémon-related crimes sounds like fun to you, you’ll probably enjoy this one. ...Especially if Nintendo gives in to fan pressure and gets Danny DeVito to be Detective Pikachu. Great Detective Pikachu: Birth of a New Duo (Meitantei Pikachu: Shin Konbi Tanjo) was released in Japan for the Nintendo 3DS on February 3, 2016. There is currently no word on a Western release.